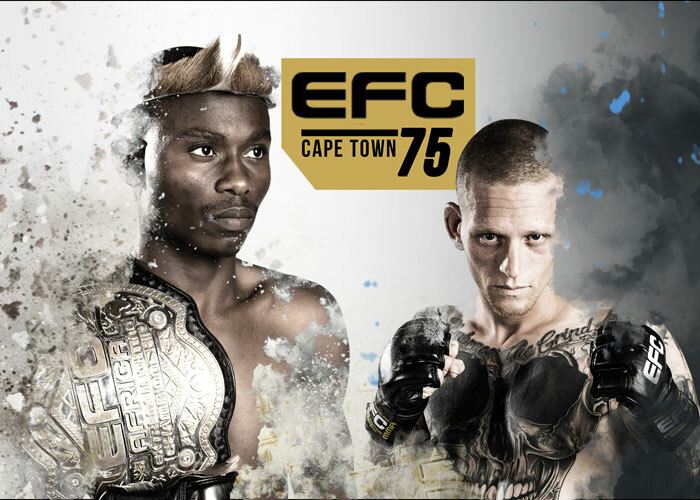 Watch some of the biggest fights at EFC 75 in Cape Town at the Grand West Arena. 1.1. The Expresso EFC 75 Ticket Competition (Competition) will be run by Cardova Trading (Pty) Ltd in association with EFC 75 (collectively the organisers/we/us/our). 2.1. Entries for the Competition will open at 6h00 on Thursday, 01 November 2018 and will close at 12h00 on Thursday, 1 November 2018 (Competition Period). 4.1. Reply to the EFC 75 Competition post that is posted on the Expresso Facebook page (www.facebook.com/expressoshow.sabc3) during the Competition Period and comment on the post with the answer to the question – ‘Who do you think will win the EFC 75 World Flyweight Championship fight between Nkazimulo Zulu and Gary Joshua, and why? 5.1. We will randomly draw 5 (five) winners (Winners) by means of an automated system on Facebook within 24 (twenty-four) hours from the closing date of the Competition. 5.2. We will notify the Winners by commenting on the Winners’ entry post within 24 (twenty-four) hours from determination of the Winners to request copies of each Winner’s identification document in order to validate his/her entry and to request further contact details. 5.3. If a Winner does not reply to the notification message sent by us by within 24 (twenty-four) hours days from it being sent by us, that Winner will forfeit the Prize and will have no claim against us. In the event of a forfeiture as contemplated herein, we shall have the right to select a different entrant on the same conditions. 6.1. The 5 (five) winners will each receive 2 (two) EFC 75 tickets to the event on Saturday, 3rd November at the GrandWest Casino in Cape Town. (Prize). 6.3. The 5 (five) winners will collect their tickets at the door of the event on Saturday, 3rd November, from 30 minutes prior to the event start time. The prize winners will be asked to present a recognised form of ID before the tickets will be issued.